Yesterday saw both a serious incident and a fatal crash involving two wide-bodied jets. While everyone escaped with their lives in the first event in Hong Kong, all on board plus at least one on the ground lost their lives in Mexico. In the first event, Cathay Pacific flight CX780, an A330, was approaching Hong Kong, China after a flight from Surabaya, Indonesia when the crew noted problems with the left engine. 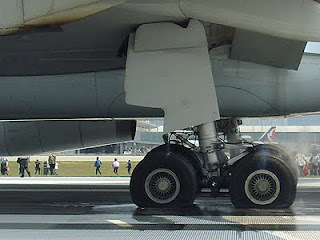 After shutting down the left engine, the right engine experienced several uncontrolled increases and decreases in thrust (Correction: FlightGlobal reports that the right engine was at idle thrust throughout the approach, and the left engine was stuck at 70% thrust, leading to a high speed landing at an incorrect flap setting). The crew declared an emergency and landed about 25 minutes later. All four tires on the left landing gear and two of the four on the right main landing gear deflated after the landing, and the 309 passengers and 14 crew members evacuated. Eight passengers were injured, with one sent to a local hospital for at least an overnight stay. It is unclear if the injuries occurred before, during, or after the evacuation. Flightglobal.com reports that as a result of this event, Cathay Pacific temporarily suspended refueling at Surabaya. Typically, US airlines offer little if any compensation to passengers after an incident like this. Unlike most US airlines, Cathay Pacific offered full refunds to all the passengers on this flight. 7 October 2008; Qantas A330-300; Flight 72; near Learmonth, Australia: The aircraft was in cruise on a scheduled international flight from Singapore to Perth when the aircraft experienced several sudden and unexpected altitude changes. About 36 passengers and crew members were injured, with over a dozen severe injuries. 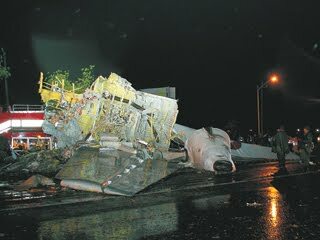 1 June 2009; Air France A330-200; Flight 447; Atlantic Ocean: The aircraft was on a scheduled international flight from Rio de Janeiro, Brazil to Paris, France when it crashed in the Atlantic Ocean off the northeast coast of Brazil. All 216 passengers and 12 crew members were killed. 25 December 2009; Northwest Airlines A330-300; Flight 253; near Detroit, MI: A passenger on a Northwest Airlines A330-300(N820NW) attempted to detonate an explosive device while the aircraft was approaching Detroit after a flight from Amsterdam. None of the other 277 passengers or 11 crew members were killed. Also on Tuesday, an A300 jet, operated by AeroUnion of Mexico, crashed during its approach to the Monterrey, Mexico airport. The A300 had departed earlier that evening from Mexico City and crashed just outside the airport in an area adjacent to a number of hotels. All five crew members, plus at least one person in a car hit by the aircraft, were killed.